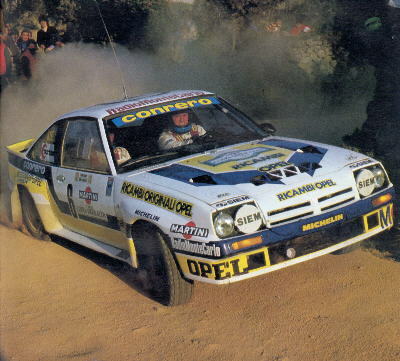 Opel’s rally program had a small measure of success, but the rally effort wasn’t as serious as the efforts of some of the other Group B contenders. The Group 4 Ascona 400, with Walter Röhrl driving, won the 1982 driver’s championship, even though Röhrl only won two rallies during the season. The Manta 400 succeeded the Ascona. It was back in 1981 when the futuristic Manta 400 was first seen in the UK driven by Tony Fall. At this time he was watching Jimmy McRae in his Ascona 400 and Fall was confident he would have the Manta in competition in a few months. It took until May 1st, 1983 before FISA gave the official stamp, no. B237 and the new car made its world debut in Corsica in May 1983 driven by Guy Frequelin. It lasted only 100 miles before the head gasket failed. McRae finished 6th on the Welsh in the first UK outing. Unlike the Ascona 400, the Manta makes full use of Kevlar body panels: the front panel, front wings, hood, doors, rear arches, trunk lid, spoiler, and even headlight holders are all made from it. This saves over 80kg and makes the car more competitive than the Ascona. Lubrication: Mobil 1 dry sump w/ twin oil coolers. The engine is a Cosworth product and, unlike its 144bhp baby brother, produces 275bhp in phase 3 form. The road going version was fitted with a twin cam 2.4 litre engine, derived from an Opel Rekord diesel bottom end fitted with a specially designed Cosworth Cylinder head. Unlike the Bosch Jetronic EFI of the road version, fuel delivery is handled by a pair of 50 DCOE Weber carburettors (rather than the 48’s on the phase 2 engine) with wilder cams. All the really worthwhile power comes in at 5,000rpm and 275bhp arrives at the 7,200rpm mark. 0-60 is in under 5 seconds; top speed is dependent on gearing. To help weight distribution, the engine was moved back 6cm. In its first outings, drivers complained of under-steer, but the main problems came from the rear axle. The rash of axle breakages was a mystery as lack of development money meant that the axles were taken from the Ascona 400 where they had been so reliable. The answer possibly lay in the fact that the axles could not cope with the increased horsepower in combination with the lighter body. 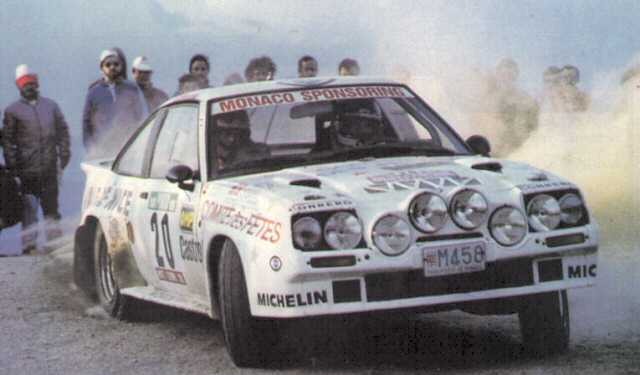 While it didn’t achieve much international fame (apart from nearly winning the Safari), it did make headlines during the Mille Pistes International Rally in France; Henri Toivonen was leading the rally in his Manta when the organizers decided to ban prototypes while the event was underway! Toivonen was forced to settle for a consolation trophy. 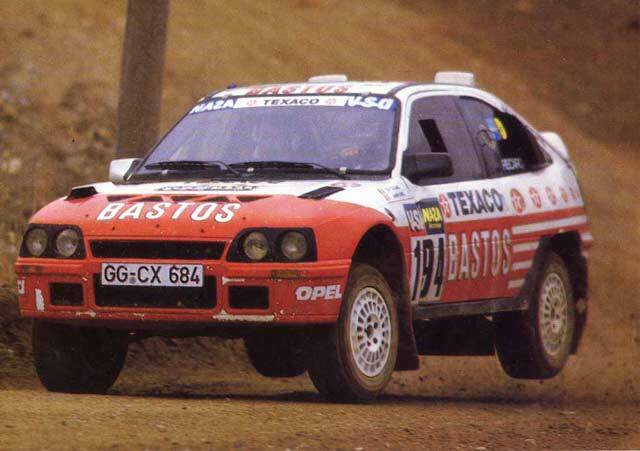 The Manta was successful on the national level, and it was a capable rallycross performer. How many of the former works cars still survive is unknown, although Ireland is known to have quite a few still being rallied. The last works built 400 is at the Griffin Trust in Ellesmere Port and is D902 RGS used by Andrew Wood. The rally history of the 400 has been well documented many times, and I am sure many readers will remember the AC Delco and Andrews Heat For Hire 400s. Russell Brookes’ old Manta 400, has been seen tucked away under a cover in a garage somewhere in Southern England. A unique four wheel drive Manta prototype did appear in Sweden before that country’s international rally in 1983 and was shown to a select gathering of motoring press as something of a publicity stunt. Its concept was simplicity itself using the Ferguson System as the only modification to the car’s Group B specification. In the ensuing tests with Ari Vatanen the car proved more driveable than a Quattro, but it was unfortunately a stillborn project. It is now owned by a member of the Group B Club. Opel was working on a group B/group S car, the Kadett 4S based on the Kadett E/Astra MkII shell. Again Opel went shopping at independent tuners and tried to put the pieces together. This ended in quite some PR embarrassment as Opel proudly announced they had this superb 500hp engine, only for the press to realize – and of course taking profit of this farce – that what Opel praised in highest respects was a Ford engine they purchased through Zakspeed! However, when Group S was due to be dropped by FIA they build another one and fitted both with 2.4L Manta 400 engines for the Paris-Dakar – to face a disaster there due to lots of broken shocks.